Malformations in the structures of the right side of the heart have been linked to mutations in the master regulator gene Nkx2-5. Researchers at the Medical University of South Carolina (MUSC) report in Scientific Reports that Ccdc117, a target gene of Nkx2-5 that is expressed in heart precursor cells, produces a protein that promotes rapid cell growth. That protein assists in the transfer of iron-sulfur compounds, created in the mitochondria, to the enzymes responsible for DNA replication and repair. When that protein is absent, the enzymes cannot synthesize DNA or unwind it to make repairs. Nkx2-5 has long been thought to promote the growth and division of precursor heart cells, but, before Lee’s finding, researchers did not know how it did so. Mitochondria, which assemble iron-sulfur compounds, were once thought of simply as the powerhouse of the cell. They are now known to play important roles in many biological functions, including DNA repair and replication. This linkage between Nkx2-5 and the iron metabolism pathway leads Lee to wonder whether lifestyle modifications by the pregnant mother, such as increased exercise and improved nutrition, could lessen the likelihood of heart malformations in the fetus. Exercise can increase the number of mitochondria, thereby increasing the assembly of iron-sulfur compounds needed for improved DNA repair and replication. For now, any connection between the general health of the mother and the risk of heart malformation in the fetus remains speculative. A definitive answer will require further study. 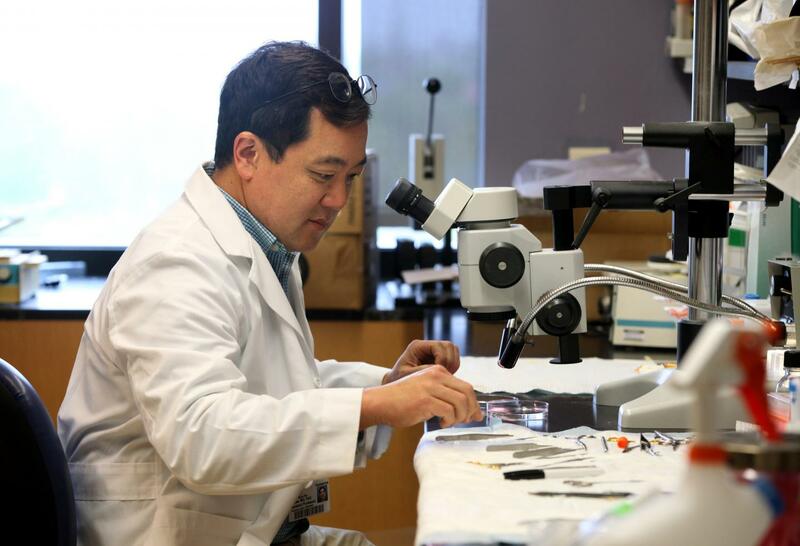 In future studies, Lee plans to examine the biochemistry underlying this pathway and to identify the types of congenital heart disease to which it is relevant. Lee is also currently studying whether the expression of Ccdc117 in placental tissue plays a role in the growth of cells that knit together the maternal and fetal circulation. He is exploring whether its absence or underexpression is linked to preeclampsia, a hypertensive disorder of pregnancy that threatens mother and baby alike. Ccdc117 is a crossover gene of interest in the two lines of his research. Lee’s studies of this crossover gene were supported by pilot project funding from the South Carolina Clinical & Translational Research Institute, an NIH-funded Clinical and Translational Science Awards hub.